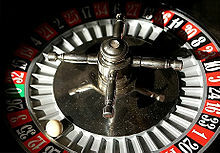 When a winning number and color is determined by the roulette wheel, the dealer will place a marker also known as a dolly on that winning number on the roulette table layout. When the dolly is on the table, no players may place bets, collect bets, or remove any bets from the table. The dealer will then sweep away all other losing bets either by hand or rake, and determine all of the payouts to the remaining inside and outside winning bets. When the dealer is finished making payouts, the marker is removed from the board where players collect their winnings and make new bets. The winning chips remain on the board.